ASTC’s Lee Kimche McGrath Worldwide Fellowship aims to help individuals from science centers and museums outside the United States to attend the ASTC Annual Conference, in the hope that this experience will help them in the development of their institutions and the growth of the field worldwide. The Fellowship is named for ASTC’s first executive director. 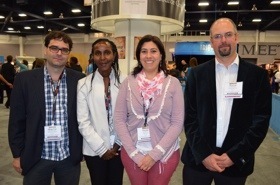 This year, four Fellows have been chosen, thanks to significant financial support from the Gelfand family: Diego Vaz Bevilaqua, director of Museu da Vida/Fiocruz, Rio de Janeiro, Brazil; Netzach Farbiash, deputy general director for scientific content at Carasso Science Park, Beer Sheva, Israel; Susan Wairimu Mahachi, a science teacher at Chisipite School, Harare, Zimbabwe, who has started working on creating the Zimbabwe Science Centre; and Fiorella Silveira Segui, head of education at Espacio Ciencia, Laboratorio Tecnologico del Uruguay, Montevideo. We spoke to the McGrath Fellows during ASTC 2013 to learn about their work and what they hope to gain from the conference. In what ways is your institution’s work meaningful to its community? Bevilaqua: Museu da Vida is located on the campus of Fiocruz and is surrounded by poor communities, so one thing that has been stressed at the museum is to really do a long-term relationship with the schools that surround the campus. Silveira Segui: Espacio Ciencia is the only museum of science in Montevideo. We provide teachers and students [with] tools, we have many workshops, and we bring students to do activities related to scientific work in laboratories. Mahachi: The science center that is up and coming, its first objective is to reach the students. So one of the main goals right now is to get a hold of a mobile center, which will be able to go out and reach the rural schools in particular, where science, particularly hands-on, practical science, is really not available. Another objective that we have in the long term is to talk about issues of sustainability, of health, of clean water, and energy, which I think are really key issues of today’s concerns. Farbiash: Carasso Science Park is in Beer Sheva. The surrounding area is 30% of Arabic speaking—that means that all of the park is in three languages—Hebrew, Arabic, and English—which is very, very important. In addition, we have Arabic-speaking guides so the local community with all its variety will be able to understand and to communicate with the guides. Since it’s a very new [science park], only three months on the air, we have some programs that are made together with the Ministry of Education, so all the kids around from all schools come [to the science park]. That way we can explore and can show science for everybody. What challenges and opportunities lie ahead for your institution? Bevilaqua: We have a big challenge for the next six, seven years. We are planning to have all these buildings that [are] occupied by the administrative staff and use [them] all for cultural purposes, especially scientific exhibitions. We will have opportunity to export more [of] what science is being done right now by the institution. Silveira Segui: We are planning to go on with workshops with students and proposing workshops for teachers to improve the knowledge about science. Mahachi: Our key challenge is to get our science center out and up and functioning. Funding basically is our key objective at the moment, to be able to get that mobile center working. From there we’ll also be able to have workshops for teachers and also be able to bring in people to the school where the science center is currently centered and be able to offer workshops to them. Farbiash: Beer Sheva is not a touristic city. We have to do all the work in order to bring people from other places and say there’s something going on in Beer Sheva and you should come. So this is one challenge. I had the chance of being [there] from the very beginning three years ago, and it’s like a dream come true to see everything that you have been working on, dreaming on, thinking on, just starting to work. We are already starting to work on renewing some of this stuff because within a year or two or three, people would like to know what’s new. So this is a challenge—and of course, the challenge of working through limited budget. What do you hope to gain from attending ASTC 2013? Bevilaqua: Networking. To gather resources about new exhibitions, new ideas, infrastructure, buildings, and all sorts of information. Silveira Segui: To have the opportunity to be in touch with other educators and to know about what other museums are doing [and] new technologies. I’m very happy to be here. Mahachi: For me, it’s been the opportunity to find out how people make exhibits, and also to network with people, [to] have access to more materials and resources through the networks, and also to build partnerships. Farbiash: To get to know many of our colleagues around the world, to have a network that can help in delivering ideas, because we are not the first science park in the world, and others have been trying to solve problems that we are just starting to have now. Second, to see some of the commercial companies that present very nice ideas. And third, to [let] people know that there is a new science park in Israel [and] to invite everybody to visit and to come to see.